Commercial Decorating covers a huge range of areas, from a single office to an Office block, Schools, Churches, Convents, Factories, Pubs and Warehouses, etc. The main consideration in commercial work is working hours, our normal working hours (7.30am-4pm) might not suit most businesses because there will be too much disruption to the staff, so we can easily change our working hours to suit, for example we can work evenings, nights or even weekends, what ever it takes to minimise disruption. Another area of commercial decorating is housing estates. We have carried out work for a charity organisation call Cluid Housing. 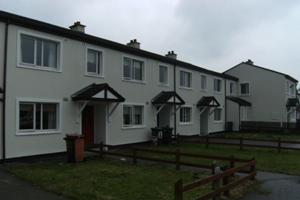 They provide low cost housing to lower income families; they have estates all over Ireland. We have decorated the exteriors of a number of estates in Dublin (Rutland st, Chapelizod, Tallaght and Clondalkin), as well as estates in Drogheda and Sligo. The one thing that stands out in these estates is we painted the houses with a self cleaning exterior emulsion (Nano Technology) which helps to keep the houses looking clean and fresh for many years to come. Convents, Daughters of Charity, Blackrock and Clontarf Dublin. 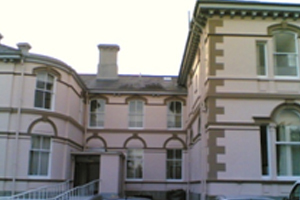 Gary Daly and Co. Solicitors on Arran Quay, Dublin. To find out more about the services that M.C. Decorators can provide please contact us.